With the best bands, it seems to happen fast. The trajectory is steep, the progression seemingly preordained, inexorable. 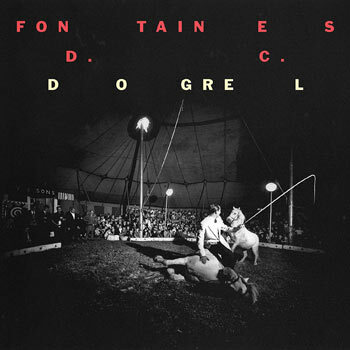 Assembling while still at college in Dublin a mere three years ago, from the ruins of early nowhere bands, and having discovered a shared love of poetry and a common zeal for authentic self-expression, the evolution of Fontaines D.C. has been swift, sure and seemingly effortless. Reluctant to be viewed as part of any wider movement (“I get a bit uncomfortable with some of the comparisons that have been made,” says Chatten, as he must, though comparisons will inevitably be made), Fontaines D.C. have delivered on their tremendous promise in a way that few bands have. It is to their credit and it augurs well that their collective eye is already on the next phase as they prepare for now to take on the world for real. Note: the LP is available on indies-only coloured vinyl. We’re offering Dogrel at special pre-sale prices, which won’t be available after release. Click here for more details and to order your copy.